I can't tell you how happy I am not to have a snow scene at the top of this entry. All of the snow is finally gone! (Replaced by rain, unfortunately.) I drove up to Zanesville on Tuesday in both directions. We had our selection meeting for the Fall issue of Cast On. There were some lovely submissions. Mail delivery has finally normalized but I received very few lessons this week which is just as well as I was traveling. Now that the weather is nice again I expect things to slow down. In several of the Basic Lesson 1s I have reviewed lately I've noticed something I have not seen before. The lifted increases on swatch 4 are twisted. It is primarily an issue on the left side but some of the right ones have been twisted as well. 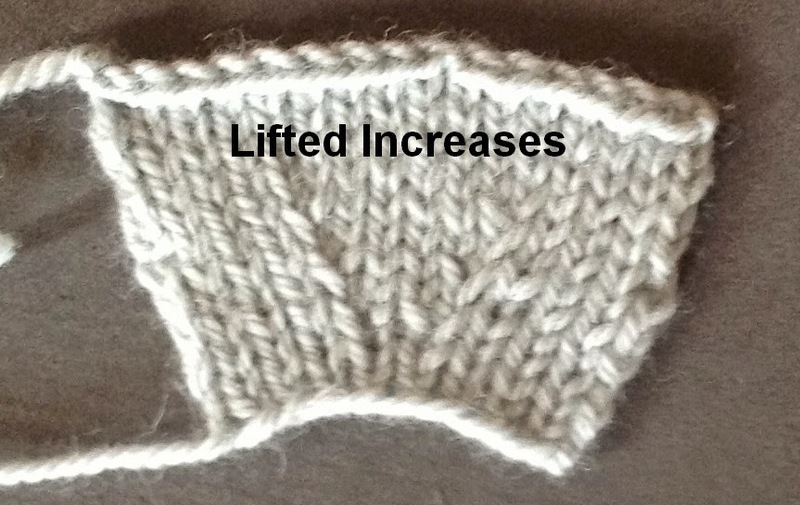 This type of increase is worked in either the right or left leg of the stitch on the needle. When worked properly, this elongates the leg and creates an attractive visual line as shown in the photograph below. 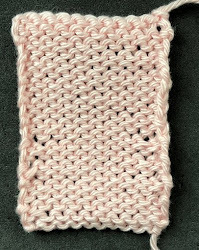 If you twist the leg of the stitch you do not get this line. The photograph below shows correct and twisted increases. The correct ones are marked with the red arrows and the twisted ones are marked with the black arrows. An increase is made whether you twist the leg or not but the twisted version is more visible and puckers the resulting fabric. I don't want to interfere with any one's weekend plans for the afternoons so Salon will be tomorrow in the morning from 10am to noon. I plan a trip to Spaldings Donuts at 6:30am in case you need an incentive to get up on Saturday morning. Well, when the back of the Wine Dark Sea sweater was almost finished I noticed the top of the waves were not identical to the bottoms. I spent a few hours deciding if I could live with this and decided I couldn't so I recharted the waves and started over. Luckily Elf has plenty of the red yarn. Here is the correct version.